It takes a certain amount of chutzpah to compete with the likes of Google, but that’s what a little start-up named Conveyal is doing. The firm creates digital tools to help transport authorities better communicate the wide array of available mobility options. Its new product is similar in functionality to Google Maps and the many consumer-based trip planners in existence. 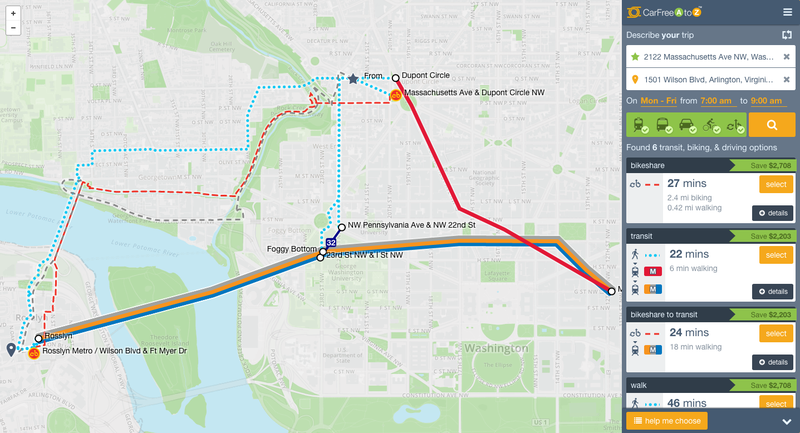 What differentiates Conveyal’s product is that it provides users with a multimodal view of commuting options in the Washington D.C. region, emphasizing those that are healthy and sustainable. Conveyal’s multimodal commute planner, CarFreeAtoZ, is a web-based tool branded to align with Arlington County Commuter Services’ (ACCS) popular Car-Free Diet campaign, which has resonated with area residents and won numerous industry awards. ACCS is a partner in the Conveyal project. That market: commuters served by ACCS’s transportation demand management (TDM) business-to-business consultant, Arlington Transportation Partners (and potentially other TDM consultants). ATP plans on using CarFreeAtoZ to create personalized commute recommendations for Arlington-area employers and employees. CarFreeAtoZ, as a platform, tailors transportation options to match the unique nature of each community. In Arlington and D.C., bike and transit is an important combination missing from trip planners. Similarly, carpool, vanpool, and drive-to-transit options are critical to many suburban commuters, but are missing from currently available tools. In other words, CarFreeAtoZ is a software tool that helps commuters solve the so-called “first-mile last-mile” problem by giving them a holistic view of the transport system. Using the tool, a user can easily display a commute trip that begins in one mode (Capital Bikeshare, for instance) and ends in another mode (like Metrorail). Facilitating multimodal connections is complex, as documented by Conveyal developer Trevor Gerhardt in a recent Mobility Lab story. Conveyal’s hard work has paid off. CarFreeAtoZ is beautiful, intuitive, and particularly well-suited to the D.C. region with its abundance of transportation options. Beta testers gave CarFreeAtoZ overall positive reviews, with 87 percent saying they would use the tool again. Credit the unique qualifications of Conveyal’s small team, which consists not only of programmers, but also urban planners and a cartographer. Conveyal founders Emory, Kevin Webb, and Andrew Byrd began their partnership at OpenPlans, a non-profit incubator for civic technology (OpenPlans is also the creator of the now Mobility Lab-led event Transportation Camp). The trio began their relationship at OpenPlans working on a transit-technology project called OpenTripPlanner. Their experience creating OpenTripPlanner, undertaken in partnership with Portland’s public transit agency TriMet, laid the foundation for much of their work at Conveyal today. Indeed, OpenTripPlanner serves as the open-source foundation fueling CarFreeAtoZ’s computations. Conveyal’s team is geographically dispersed (in New York City, Atlanta, Paris, and Washington), but the creation of CarFreeAtoZ could perhaps only have occurred in the D.C. region. Washington has quickly established itself as fertile ground for transportation-related technology start-ups such as the technology incubator 1776 and Arlington County’s similarly positioned Disruption Corp (two companies that recently announced they are merging, in fact). Arlington County’s long history as a nurturer of public-minded products was a key factor in Conveyal’s creation as well. In 2011, ACCS’s research arm Mobility Lab announced a fellowship program for aspiring transit techies. That project was borne out of a conversation between ACCS’ Chris Hamilton and Greater Greater Washington founder David Alpert (a former Google employee himself). Conveyal’s fellowship produced promising results, leading to a grant for the project, awarded from the Virginia Department of Rail and Public Transportation. ACCS matched the DRPT funds. CarFreeAtoZ was an important early project at Conveyal. Emory says, “As one of our first larger, longer-term contracts, it gave us the ability to think ahead and start expanding the team.” Being tapped by Arlington to head up this new project – at the time called the Transit Tech Initiative – allowed Conveyal to staff up its team. 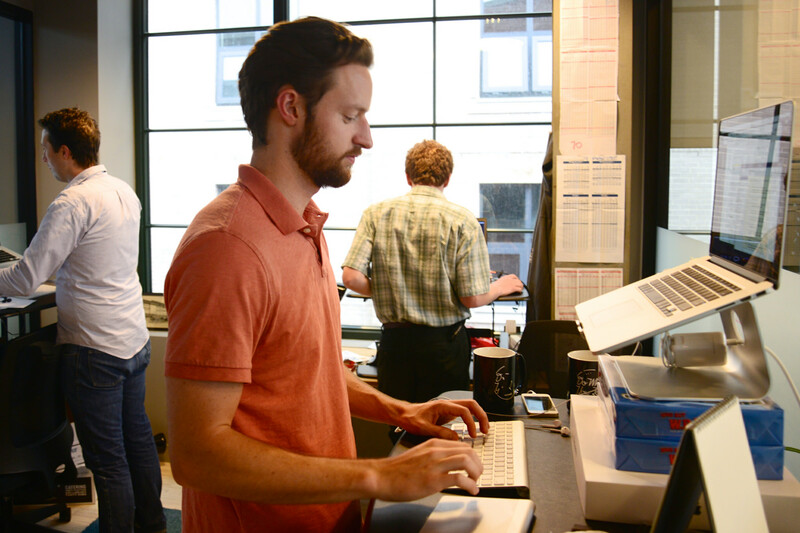 Conveyal now employs six people, and is expanding to support deployments of the CarFreeAtoZ tool in communities beyond Washington. They are also devising a new tool to be used by transportation planners, tentatively simply referred to as Transport Analyst. The Conveyal team has discussed the possibility of a standalone CarFreeAtoZ mobile app, but for now they are concentrating these efforts on making the web-accessible interface mobile-friendly. Meanwhile, Conveyal’s engineers are busy tweaking and improving CarFreeAtoZ for Arlington. The tool recently added support for Capital Bikeshare trips to buses and the Metro, for instance. TDM agencies that wants to provide tailored commuting recommendations for its clients. CarFreeAtoZ left beta and went “live” last month, and will soon be rolled out to Arlington-area employers by ATP. It is the latest of Arlington County’s incubated transit-tech projects, which include TransitScreen, CarFreeNearMe, OneBusAway, and Capital Bikeshare. Is China Considering a Divorce From Its Car Culture?